From The Tracker Magazine, Feb 1982. 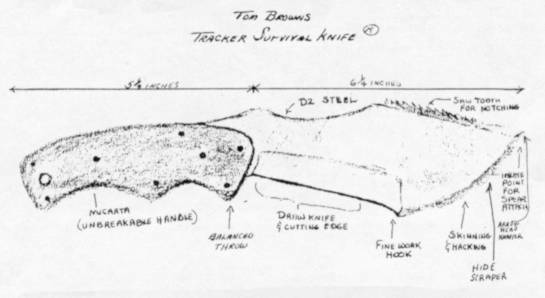 The Tom Brown Tracker Survival knife is made exclusively for Tom by Robb Russon, a custom knife designer. This knife does an outstanding job for the serious survivalist. Take a look at the picture to really appreciate what this knife can do. The price of this custom made knife will be under $200. Delivery time will depend on number of orders. If you are interested in purchasing one, or would like to get more information about the knife, contact us at the farm in New Jersey and we'll give you further details. NOTE: A few people have asked about getting the knives made to fit their hands individually-custom made knives of this sort will run anywhere from $400-$700. Attention hunters, trappers, outfitters, and outdoor people! 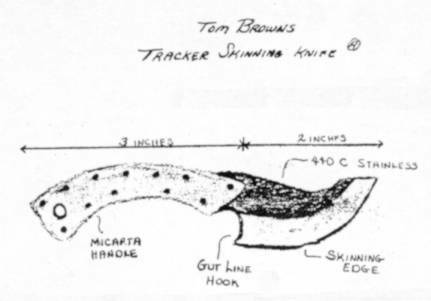 Here's Tom's custom made tracker skinning knife. Like his survival knife, it's made by Robb Russon. The knife forms to and fits the hand beautifully. It is great for skinning and capping out your animal. The price of this knife is under $40. Delivery time will depend on the number of orders.